I always feel a bit foolish when writing out these mini-bundle reviews for the Humble Bundle, because chances are you've already bought it. It's cool, I don't mind that you didn't hold your breath for me to say whether or not Botanicula is charming. The fact is that even with their slight diversions into smaller and more Android flavoured territory, the Humble Bundle always seems to pack in the biggest and most popular games on the market, and their staunch commitment to forgoing a minimum, their requirement of Windows, Mac and Linux versions plus the nice perk of letting their users set the divide of the profits means that Humble Inc. will likely stay on top for a while. 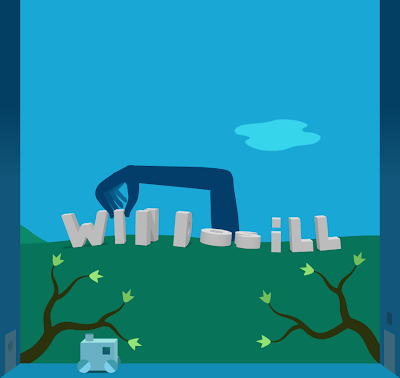 Paying at least five dollars nets you a Steam key, while if you beat the average (which has been settling in at just under nine dollars), you'll pick up a copy of Windosill as well, an adventure game/art piece from Vectorpark. 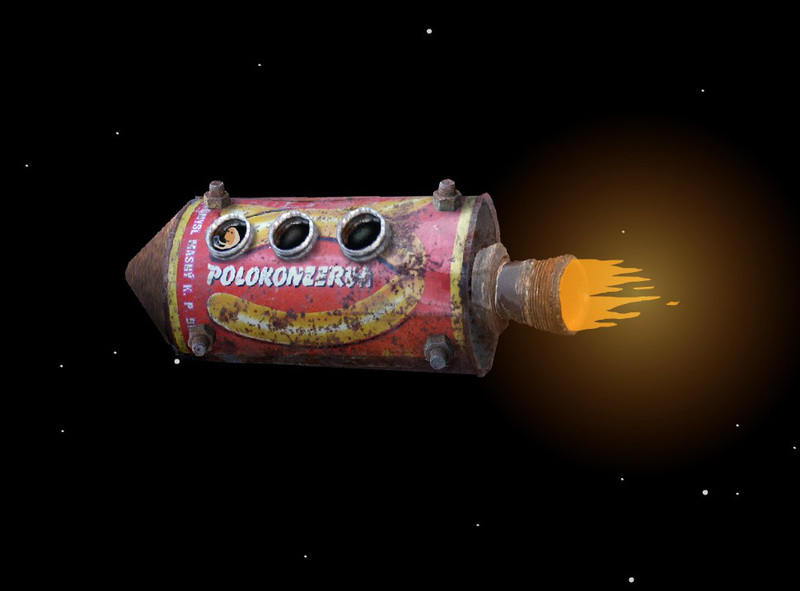 You also get access to Kooky, a Czech film that Amanita did some of the art direction for that looks pretty neat, but only contains an English dub. Now I love me some foreign films, but I always prefer subtitles which are unavailable here. But even if you don't mind dubs, the curious choice to use Czech actors without a firm grasp on English is quite distracting from the nice visuals. Still, it's worth a peek. But this here is Backlog Journey, not amateur film critic night! You're here for games commentary, and I aim to please. I'm going to change up my usual formula and start with the beat the average bonus, slowly working my way up to Botanicula at the bottom. If the suspense is killing you, skip past the break. I find the "Are Games Art?" debate to be a bit tedious and an increasingly outdated mode of thinking. The most common argument comes from Steven Spielberg of all people, who famously claimed that games could be art once “somebody confesses that they cried at Level 17.” People were quick to jump on him with claims that the moment had already happened (did you see what happened to Aeris?) but I highly disagree with that metric. In my view, video games are a lot like films; all films have some artistic merit based on aesthetics and emotion, but not all filmmakers set out to make a work of art. But then again, some do. By every metric, Windosill is exactly what you'd expect from a work of art. It's a beautifully animated puzzle experience with minimal elements to tear you away or remind you that yes, this is a game on your PC. Each scene looks like a lovely slightly Dadaist painting which wouldn't look out of place on a wall of a museum. There's no doubt that the aesthetics are clearly the strongest point in Windosill's favour, and anyone who tries to claim that this isn't proper artwork because it shows up on an iPad screen instead of a swath of canvas is just being pedantic. But the thing is, and this is where many art games somewhat fall down, a game still should be fun. In my brief university mandated flirtation with art history, the lighter side of Dadaism was always described as a playful movement that tried to focus on poking fun at the more serious of art critics. While I'm not trying to say Windosill is some kind of adventure game meta deconstructionist work, it does retain that playful sense of whimsy and dedication to making artwork fun. The scenes are always filled with plenty of things to poke and spin and throw and just gaze at. The puzzles are almost universally intuitive; it's usually not overly challenging to figure out, but more importantly it's quite a lot of fun. Every object seems overly reactive to your clicking and dragging and pulling and it gives the game a toybox feeling of just playing with the elements. Not every gooey thing will help you solve a puzzle, but yanking on said gooey thing to watch it snap and wobble back and forth is the kind of childlike amusement Windosill likes to offer. Let me step down from my pretentious platform for a second, because this section of my review is probably going to be the most important section for most people. Buying the bundle is a no brainer, but going over the average might be a bit more questionable for people who don't have a ton of extra money to go around, even to a worthy cause. There are nitpicks, like the fact that Windosill is quite short with a small online demo showcasing exactly half of the levels in the full priced version. 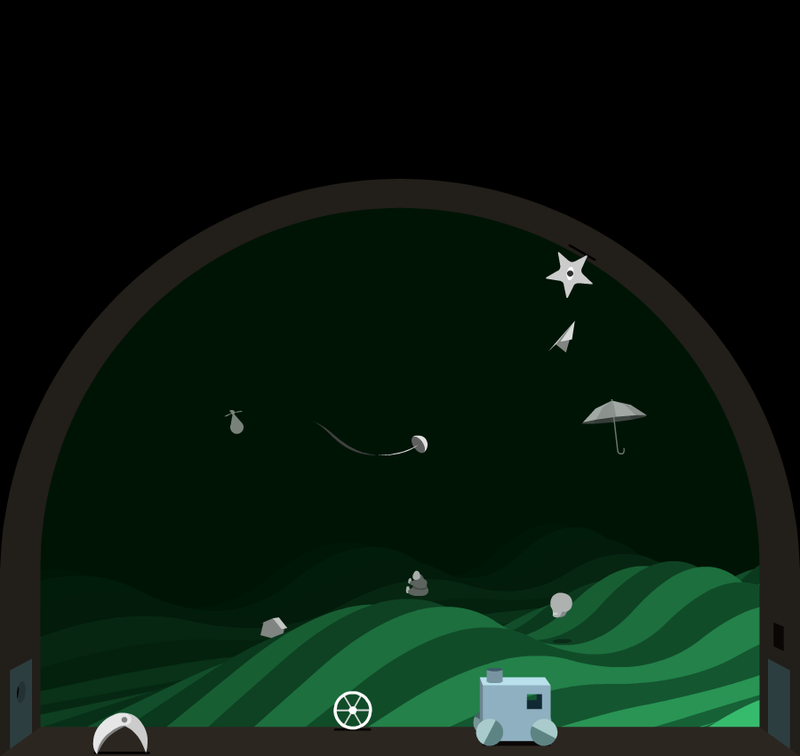 It's also feels a bit off when it comes to the mouse controls, clearly more suited to an iOS environment. So I suppose the main question I need to answer boils down to "is the game worth it?" And I'll step right back up on my pretentious platform and say that it would be difficult and irresponsible to give a straightforward answer. Is art worth it? That's a heady question for a blog that started solely as an outlet for me to crack jokes about older games. But if you are the kind of person fascinated by how art is becoming interactive, or if you just love to see a creative use of the medium, then yes, Windosill is worth experiencing. It's a fantastic example that even if all games are not art, art can indeed take the form of a game. Vectorpark might share a lot of similarities in style, but the next three games are all Amanita. I've mentioned it before, but I always find it fascinating to look at a game developer's release history all at once. Excluding some small side projects, the Humble Debut includes all of Amanita's catalogue thus far, and so it gives me this rare opportunity. Let's get started. I promise I won't try to pull off my lengthy "games as art" preamble again, but suffice to say that Amanita Design is a studio devoted entirely to making art. It showed in the initial freeware Samorost title, and it shows here too. Samorost 2 picks up on the little white hooded man from the first game, but suffice to say this is a very self contained adventure. Aliens have come down to the little fellow's asteroid and kidnapped his dog, and after he hops off in pursuit using his soda can rocket you need to manipulate the environment to help reunite the best friends and get them safely back home. The art style is probably the most important topic when discussing an art game. Both Samorosts borrow heavily from the style of Czech artist František Skála, an artist that often combines organic and natural elements to appear as something more modern. While that nugget of information on its own is interesting enough, it is neat to see how this fusion of themes informed everything Amanita has done since. 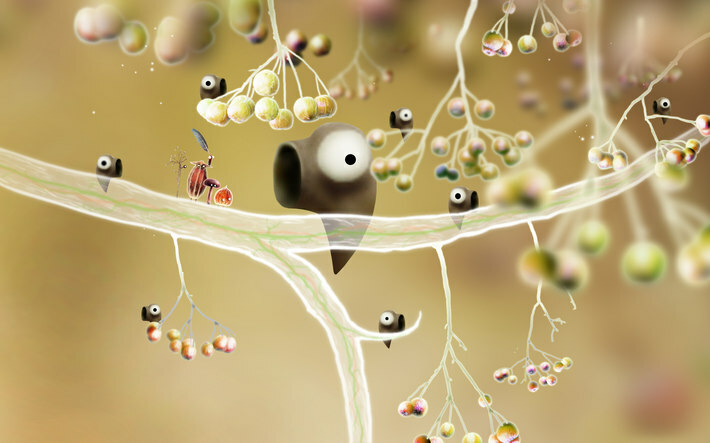 Botanicula is a game with a major organic theme. Obviously Machinarium is a game that concentrates on technology. 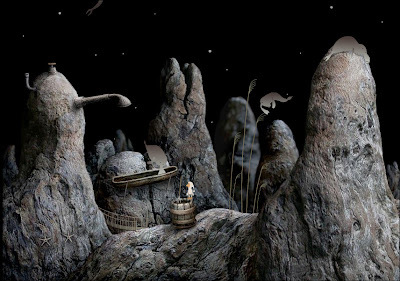 Samorost 2 sits in an interesting place as the team's first full game, because it combines both of these themes into a surrealist mixture and therefore works as the beginning point where both later games took two sides of the same coin to the logical extreme. 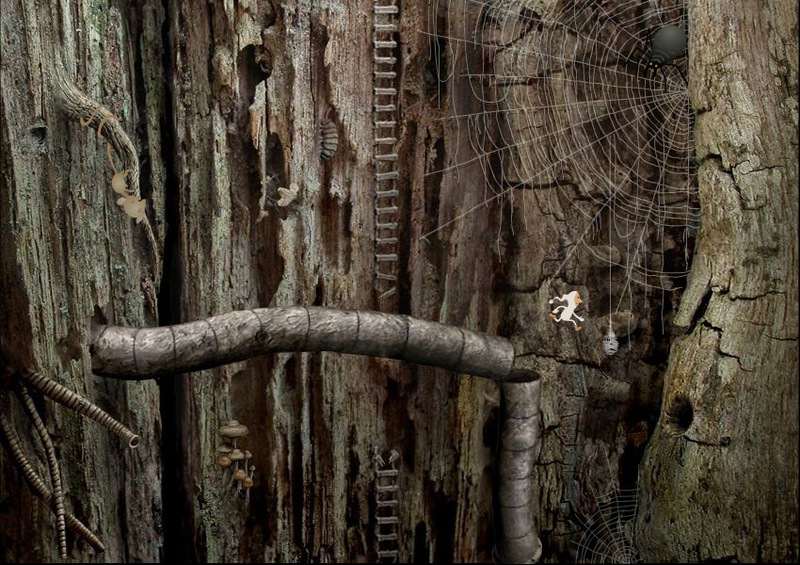 But back to Samorost 2 itself. The environments tend effortlessly blend the photorealistic with the minimalist, using simple line drawings for some elements or magnified photographs for others. It's a fantastic way of making any common element from a backyard look utterly alien, but the cartoonish characters ground the game into more familiar and chrming territory. While I wouldn't necessarily call the graphics cohesive, they are striking to look at, using a blend of themes in interesting ways. It's a game that's truly visually unique, something that very few games can claim to be. The game itself, like all Amanita games, is a point and click adventure distilled to the core. There's no inventory, no UI, no conversation, little music and very few clickable elements in each scene. The lack of inventory and UI serve to give the game a minimalist structure and let you concentrate on the self contained puzzles. The vast majority of the puzzles are grounded in a combination of a hidden picture book and common sense, and even the more surrealist moments still cater to a weird internal logic of the game. The only time the gameplay stumbles is during the many timing based puzzles; they can be a bit unforgiving with the window of opportunity to click whatever tiny bug or switch you need to press, which occasionally caused me to assume I was off-base and get frustrated looking for other solutions. The minimalist and self contained nature of each of the puzzles works well to keep the game's scope to a minimum, and prevents the often frustrating adventure game problem of being unaware of where to go. You always know where to go, the question is what to do to get there. The game is quite short, able to be finished in an hour for particularly savvy adventure gamers. But overall Samorost 2 manages to present a game as a work of art without losing out on what makes an adventure game fun. It's an experience in minimalism, but the minimalism works to present some fun puzzles amidst the surreal organic spacecraft. 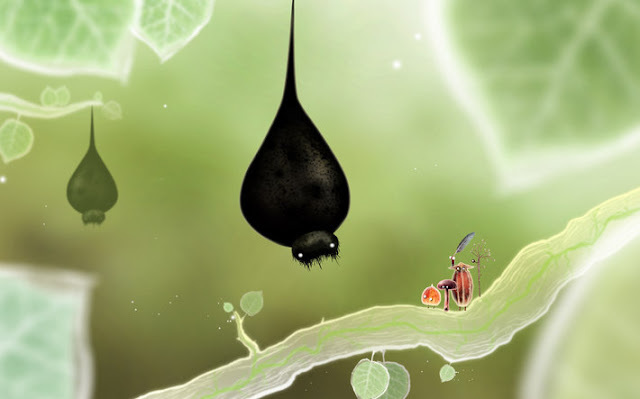 Though Samorost 2 is the first retail game by Amanita, it's quite short. 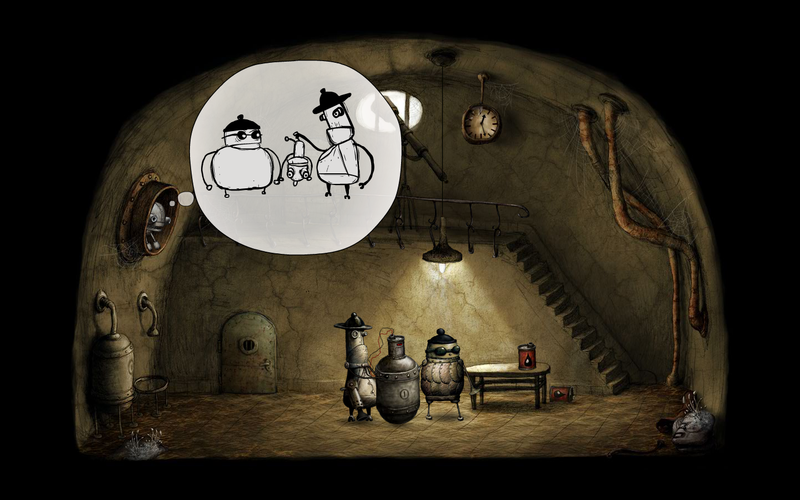 Their first full length release is Machinarium, which feels far bigger and better in scope, and overall provides a more cohesive, fun and adorable story. It's also one of the best indie point and click adventure games ever made. It easily reaches an artistic height beyond most adventure games, but it manages to be quite a fun experience too. Obviously the sketched out and beautiful graphics are the most noticeable and rightly praised portion of the game, but the gameplay and puzzles are much improved from Samorost as well. "How much for a bundle that DOESN'T have Machinarium?" one particularly cynical Facebook post read, and in fairness they have a bit of a point. Chances are that if you're reading this, you likely have Machinarium. But even though it's pretty prolific at this point, that doesn't diminish the fact that the game is quite excellent. If you somehow dodged every other Humble Bundle that included the game (or the soundtrack) this is the chance to pick it up, and I'd say that would be a pretty great idea. The central point most people focus on are the graphics, which are certainly quite beautiful and unique. Personally, I think the setting and story contributes a lot to this. 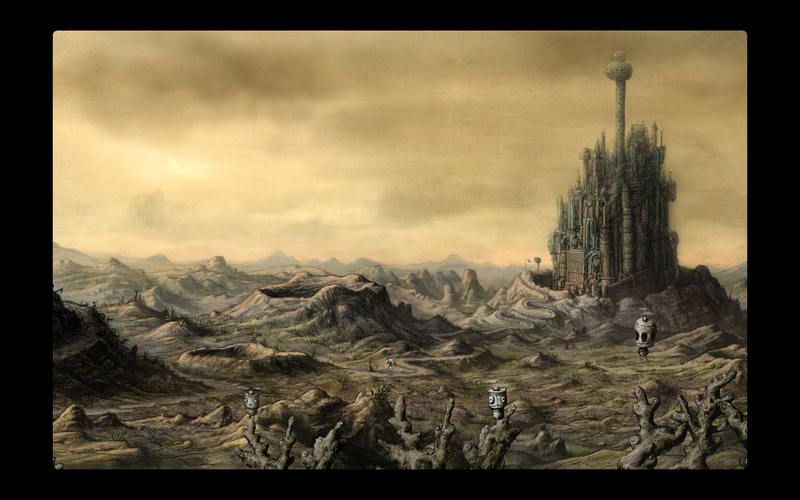 Machinarium takes place almost entirely in a city inhabited by a population of robots. It's almost a bizarre parody of society, with specific robots built to serve inane purposes to keep the city properly running for almost zero discernible purpose. It humanizes all of the robots in the story, even the silent and generally quite neutral (but adorable) nameless protagonist. Your little nameless protagonist seems to be on the bottom of the social food chain in this bizarre little reflective society, and the game is entirely centred on the time honoured story arc of foiling the bullies and getting the girl, though it might not be all the obvious at first. The story is essentially revealed by showing, not telling, and aside from a bit of tutorial text there's absolutely no written words throughout the work. Even the sound is limited to murmurs and shapeless noises, which makes the fantastic and beloved minimalist soundtrack all the more important for setting the mood of the mechanical city. The graphics might be pretty, but more importantly they serve the storyline well and shape the fantastically human-like robots into endearing and memorable characters. The most important part of an adventure game is the puzzles. Unsurprisingly, they're often the main problem I have with adventure games as well. I personally don't much care for the use everything on everything style of puzzles, and some adventure games get so bogged down with that kind of gameplay I can't really enjoy it. Machinarium does tend to use these kind of puzzles fairly often, but Amanita makes several great quality of life tweaks. 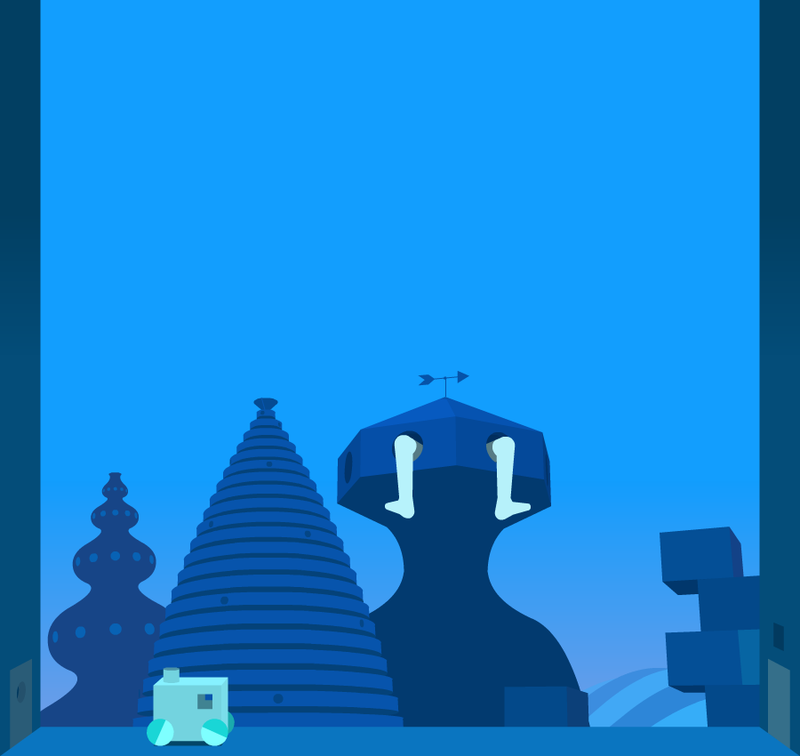 First of all, the game's inventory is quite limited and free of red herrings, and any useless items are quickly removed from your robot's cavernous stomach. Secondly, the game has a built in hint system that does a good job about prodding you in the right direction (although some of the hints are decidedly unhelpful). Third, the game has a complete pictorial walkthough built in for moments of pure frustration, but it's locked behind a short shoot-em-up. This is just enough of a deterrent for using it every time you're stumped, but easy enough to access if you have zero idea of what you need to do. It's one of the better hint systems implemented in modern point and clicks. It looks great, but even beyond the graphics lies a very professional point and click adventure. It's definitely the kind of game that can be enjoyed and held up as a classic, and a great example of the opportunities for older genres to shine in indie gaming. For adventure gamers, Machinarium is a must-play modern classic. And here we finally come to Botanicula. Trying to sum this game up in a few quick words after a couple hours of playtime is probably not going to do much good, and there are plenty of other great reviews coming out around now that can express the quality of this game is far more eloquently than I can. But I can certainly give a few quick discussion points, and it might help you decide whether or not to take a closer look at the game. 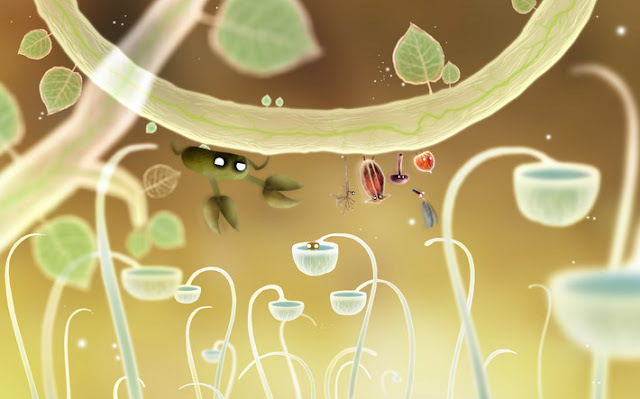 Like I predicted way back in Samorost 2, Botanicula is the natural extension of the organic theme in that game, and is essentially the distaff counterpart to Machinarium. Instead of mechanics and cityscapes, we have greenery and insects. While it's still pretty obvious that both are Amanita games, and both do share the same cute drawing style, even the graphics of Botanicula are a far cry from their previous effort. Machinarium was characterized by dark lines and a subdued palette, while Botanicula is all white lines and bright glows. Like prior Amanita offerings, it's simply a beautiful game, and arguably the best looking one yet. I love Machinarium's detailed cityscapes, but Botanicula fully commits to making the visuals bright and packed with eye candy. It's altogether more simple, but more surreal and, excuse the cliché, magical. Another difference from Machinarium is the way the story is presented. While Botanicula retains the much appreciated commitment to nonverbal storytelling, the plot of Botanicula is altogether more simple and explained to you immediately on starting the game. Dark spider-like creatures are invading a tree and killing everything they touch. The tree has one seed that escapes the purge, and it falls into the hands of one of the half plant creatures living there. It decides to right the wrong, and sets out with four friends to reach the forest floor, plant the seed and continue the circle of life. 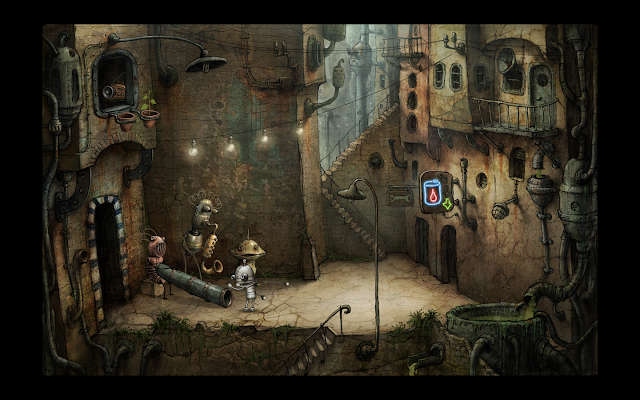 Again like Machinarium, Botanicula enhances the story by creating a varied world of human-like characters. The plant-bugs that inhabit the tree are extraordinarily varied and it's easy to guess personality of each bug through the graphic design alone. One of my favourite bits is the commitment to the multiple protagonists, each of which are particularly suited to certain situations. Sometimes the telescoping limbs of the stick-bug come in hand for grabbing things in small spaces, or sometimes the leaf-fly has to pick up a particular treasure from a distance. It's a cool and underused idea for adventure games, and though it doesn't seem to get enough use here it's still a neat feature. I suppose the big issue I had with Botanicula is the ease of it. The hint system of Machinarium is removed, but the game is simple enough that even dumb old me had zero issues with a single puzzle. This has an unfortunate side effect in that Botanicula essentially relies on graphics and sound alone to make the game great, though the simple and easy gameplay makes it a great candidate for first time adventure gamers or even for kids. In fact, this is a fantastic candidate for a young child's first adventure game. The visuals alone are so sweet and endearing that even my cynicism about the game being too easy was washed away. The (included) soundtrack is fantastic as well, even better than the minimalist Machinarium through its use of natural sounding choirs and pure unadulterated cheerfulness. In terms of gameplay, Botanicula doesn't quite stack up to prior Amanita efforts, but aesthetically the game is probably the best effort they've put forward yet. You can pick up the Humble Botanicula Debut right now, with about a week and a day to go as of this publishing. The proceeds appropriately go towards the World Land Trust, with 1100 acres of rainforest already saved. What a nice cheerful feeling. I specifically decided against mentioning the whole preorder controversy, but I should touch on it here for a second. People who preordered the game definitely shouldn't be upset about the bundle, because it's clear that they preordered out of support for Amanita and it seems Amanita has realized their mistake and mostly given everyone an equal product now. The only real people hurt by this were the teams behind GOG and GamersGate, but GOG at least has been doing a tremendous job of making lemonade. While I can't say I appreciated the attitude and response from Amanita, and day 1 release bundles opens a whole can of worms I'm not super enthusiastic about, overall the bundle is a fantastic and very profitable charity drive for a great cause. Good work all around. Where is your flattr button? Good job on making a RT from @Humble. And another good job on embracing this as a debut. It seems odd to see people say this is a horrible bundle when it isn't meant to be a bundle. Also, for future reference, I'm Chariblaze.